How delicious are home-baked savoury tarts, filling the kitchen with the aroma of golden pastry and creamy filings. 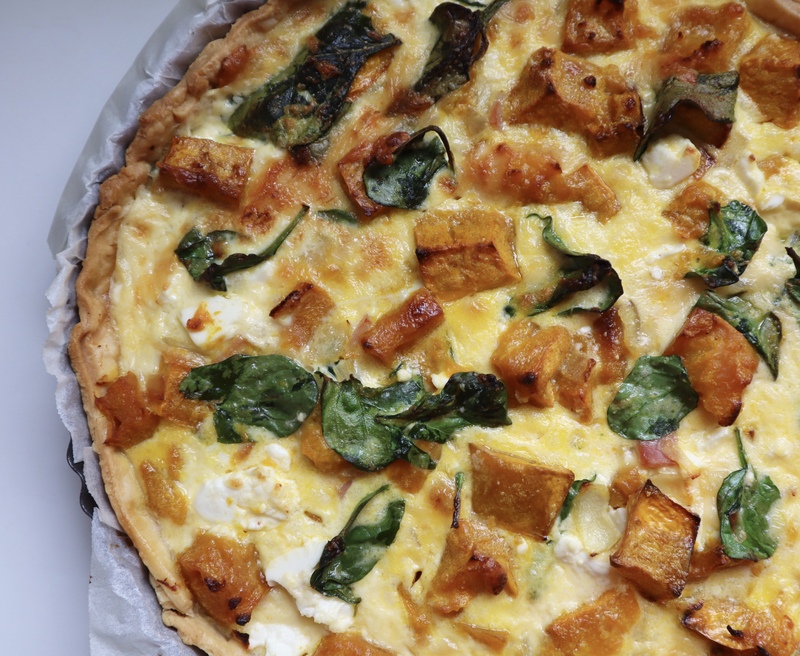 This tart makes the most of seasonal pumpkin which combined with smoky bacon and spinach is a total crowd pleaser. Pre-heat oven to 180 degrees Celcius (350 Fahrenheit). To make tart case line a round tart dish with baking paper and lay shortcut pastry in to dish, pushing it into the edges making sure the sides are fully covered (you will need to use the second sheet of pastry to cover all of the edges). Prick the base of the pastry case with a fork and blind bake in oven using pastry weights or dried beans for about 15 minutes. Remove from oven. Drizzle pumpkin with 1 tablespoon of olive oil and bake for about 40 minutes until pumpkin is golden and cooked through. In the meantime, lightly fry onion and bacon in remaining olive oil until the onion is translucent and cooked through. In a bowl mix eggs, cream and Parmesan cheese. Add baby spinach to egg mix and gently stir through. When pumpkin is cooked, remove from oven and allow to cool slightly. Layer tart case with onion and bacon, top with roast pumpkin and pour over egg and spinach mix. Crumble feta on top and season with salt and pepper. Bake tart in oven for 20-25 mins until lightly golden and set (test with a skewer). Remove from oven and allow to cool slightly before serving. Enjoy! Want more savoury tarts? Click here for our Asparagus, Pea and Mascarpone Tart and here for our Bacon, Egg and Roasted Tomato Tart. Heavenly Soulful. Keep sharing & back follow me. Thanks. Gorgeous! I cannot wait to try this on hubby. Let us know how he enjoys it! This looks so comforting. Perfect for a fall weekend brunch. Thank you. Oooh I do love a good quiche – I make a similar one to this but with lot’s of red onions as well!